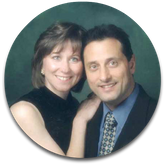 Larry and Donna DeSantis are the founders of Aquila Christian Ministries. Ministerial Training through Living Word Christian School of Ministry, Forest Park, IL. Graduate of the Joseph School of Business and Entrepreneurship , Forest Park, Illinois. Larry DeSantis is a Doctor of Naturopathy in Original Medicine who teaches and consults on spiritual and natural health to the Body of Christ and to all people.You may get in touch with him for guidance during weekly revival meetings at Aquila Christian International congregations in Illinois or Wisconsin.